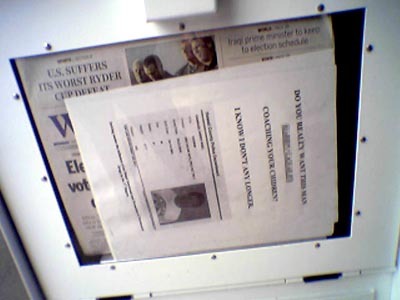 Before stopping by Ba-Le for lunch today I glanced at the WHT paper box and this is what I saw (camera phone photo). It was a bunch of flyers someone stuck in front of our paper that said “DO YOU REALLY WANT THIS MAN *MAN’S NAME* COACHING YOUR CHILDREN? I KNOW I DON’T ANY LONGER.” It has the guy’s name on there (I’ve blurred it out) along with some kind of law enforcement printout of the charges against the guy. Something about promoting detrimental drugs in the 3rd degree and other stuff including a photo of the guy. I called the circulation manager and he asked me to get it out of there, so I bought a paper and found that there were about 20 of these flyers in there. I mean WTF? If someone really wanted to let people see it why not just leave it out somewhere for folks to take for free? People often misuse our delivery systems to leech onto for distribution. They put stuff in the newsstands, they put stuff in residence paper boxes. We have to watch for this kind of stuff. What if this guy is innocent and he thinks we put it in there? Sue job. We did an internet search and found out he is indeed a coach in town, or was at the time the info was posted on a website. I ain’t saying who it is but I did show a copy of the flyer to someone who visits this blog. Previous PostPrevious Vote early, and vote often.